1708 Gallery sponsors a billboard in Jackson Ward as part of a national project | Arts and Culture | Style Weekly - Richmond, VA local news, arts, and events. Since the midterm elections ended, the influx of political mail circulars, TV commercials, and nonstop phone calls have finally ceased — for now. But social inequalities don't cycle through only on election years. In 1941, Norman Rockwell completed a series of paintings called Four Freedoms about freedom of speech, freedom of worship, freedom from want and freedom from fear. Idyllic and filled mostly with white people, it is a carefully orchestrated depiction of America. Inspired by this series, artists Hank Willis Thomas and Eric Gottesman wondered what freedom looks like in the 21st century? Two years ago, it led them to found the nonprofit, For Freedoms/50 State Initiative, a platform that works with institutions across America to foster community dialogue and civic engagement through gallery and museum exhibitions, town hall meetings, billboards, yard signs and public programs. It's billed as "the largest creative collaboration in U.S. history." And yes, Richmond has a billboard in Jackson Ward. 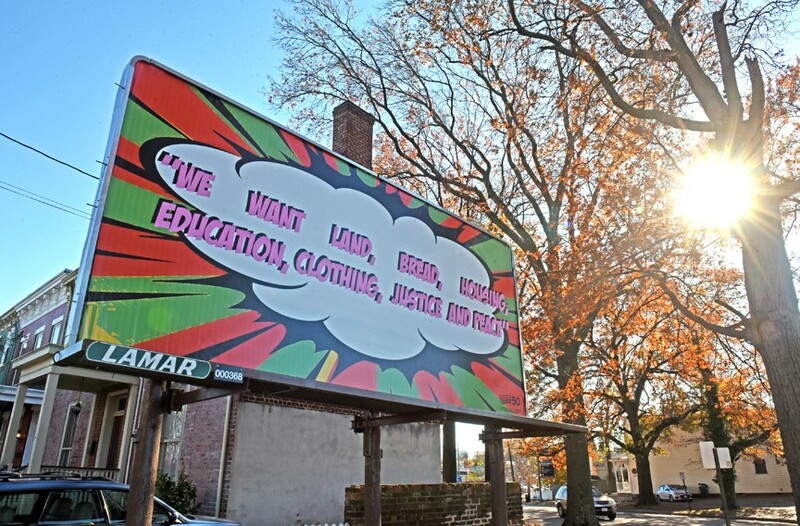 Commissioned by 1708 Gallery and completed by African-American artist Sable Elyse Smith, Richmond's lone billboard sits at West Jackson Street and Chamberlayne Parkway. It stands immediately in front of the Rev. William Washington "W.W." Browne's historic house, the site of the first black-owned bank in the United States, which opened in 1889. Organizing curator Park Myers explains that the work is site-specific, he and Smith also considered places in Carytown and Scott's Addition, but chose the location for its historical context and intimate scale that allows visitors to see the billboard from foot, bike, a vehicle or public transportation. Printed on the billboard are the words "We want land, bread, housing, education, clothing, justice and peace" in pink letters overtop of a cartoonish white cloud image with radiating orange and green stripes emitting out from the words. Though the quote isn't identified on the billboard, it is from the Black Panthers' 10-point program, a set of guidelines first published in 1967. 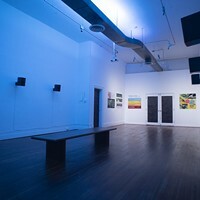 Since last summer, seven institutions in Virginia have participated: 1708 Gallery in Richmond, the Chrysler Museum of Art and the Virginia Museum of Contemporary Art in Tidewater, the Fralin Museum of Art, the Office of Human Rights and the Jefferson School African American Heritage Center in Charlottesville, and the Maier Museum of Art at Randolph College in Lynchburg. 1708 Gallery and the Museum of Contemporary Art sponsored billboards, one and five respectively. At 985 Ingleside Road in Norfolk, a billboard by the art collective Gran Fury shows a brown baby dressed in a diaper beside the words "Welcome to America: the only industrialized country without national healthcare." Another billboard by Teens with a Purpose, a community nonprofit for underserved youth, sits at 100 W. 20th St. with the words "They See Tragedy. We See" beside an image of a community garden with colorful hand-painted planter boxes. Alison Byrne, director of exhibitions and education at the contemporary art museum, explains that when Thomas invited them to participate in April, she enthusiastically answered yes and knew immediately that she wanted to work with Teens with a Purpose, who planned the billboard in four workshops. 1708 Gallery's billboard is up through Feb. 3, and the Virginia Museum of Contemporary Art's billboards are up through Dec. 31. For information about For Freedom see forfreedoms.org.